As a child growing up near, and frequently visiting the Pro Football Hall of Fame, I watched countless NFL Films productions in a “theater” in the Hall and, of course, on television every Saturday. 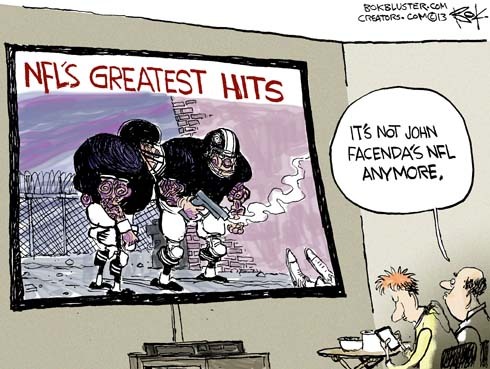 Facenda’s work was memorable and your cartoon is, unfortunately, spot-on. In one of the films I recall the quotable and colorful former coach Jerry Glanville telling a rookie on-field official that if the young official continued to make “calls” like one the Glanville disliked, NFL would represent Not For Long would the young man’s career as an official last! In line with your cartoon and recent news stories regarding the number of professional football players charged with serious crimes, today the acronym NFL may represent New Felons League for too many players.